So I just want to say that YESSSS it was a great first and important step taken towards the ultimate goal of political equality for the sexes in 1918, and it feels like a FANTASTIC cause to celebrate this year and an opportunity to raise awareness on a variety of issues that women are still encountering. This centenary celebration has the power to start up important conversations but I also want to remember that back in 1918 not ALL women were given the vote, and not ALL women got the vote on the same terms as men. The rest of the women in the UK had to wait another decade and when I looked at the dates from around the world when other woman got the chance vote (and let’s not forget that some still don’t) then it really affected me. I wanted to create a piece of work that would celebrate the collaborative efforts of a variety of Women’s Suffrage campaigners. Though they had their own complex histories and weren’t necessarily working side by side amicably toward the common goal but it felt only fair to try to capture a snapshot. I just know I could keep adding and adding to this image because with every new person I begin to learn about I just all further down the rabbit hole! It is merely a dot on the landscape of amazing women who deserve to be celebrated. My starting point when selecting some of the initial women who were a part of the Womens Suffrage movement was to dive into my sketch book under the list in the front titled 'Women I'd Like To Eat Brunch With'. Each print will also include a further reading booklet and identification key to hopefully help you to learn more about some of the Women's Suffrage campaigners I have featured. "The Fawcett Society is the UK’s leading charity campaigning for gender equality and women’s rights. Today we continue her legacy of fighting sexism and gender inequality through hard-hitting campaigns and impactful research. We believe in a society where no one is prevented from reaching their full potential because of their gender. 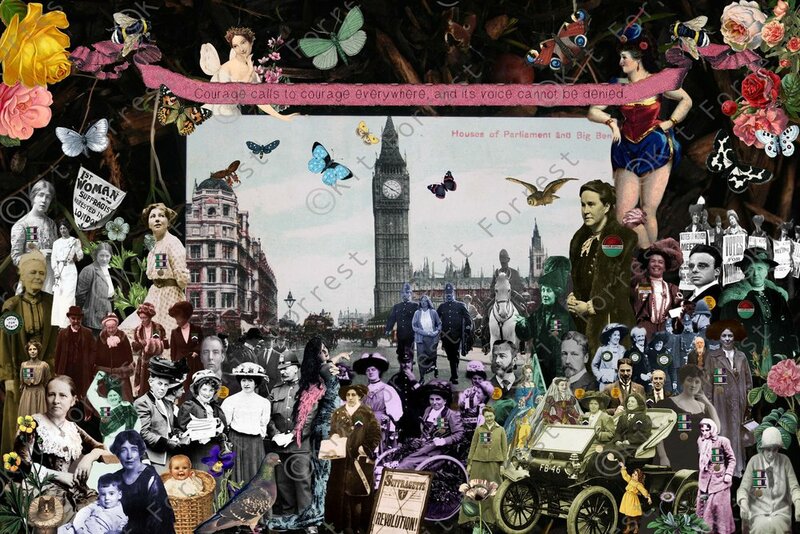 "The Fawcett Society's story begins with Millicent Fawcett, (In my collage she is standing prominently to the right wearing a green/red NUWSS badge) a suffragist and women's rights campaigner who made it her lifetime’s work to secure women the right to vote. 2018 marks 100 years since women first secured the right to vote, and Millicent Fawcett will be making history again. She'll become the first woman commemorated with a statue in Parliament Square – a landmark moment for the wider suffrage movement, and for women everywhere."